Sight Action (Havering) operate a free ‘Telephone Befriending Service’ providing regular contact to those vision impaired people who are isolated or housebound because of their sensory disability. We work closely with other groups and agencies within Havering and beyond, to ensure that the needs of people with sight loss are not overlooked. We also run the ‘Sight Support Service’ in the Eye Clinic at the Queens Hospital in Romford, providing advice, information and support to patients, their family and carers, on issues relating to sight loss. Hackney VI Group are putting on a series of events and activities with refreshments for blind and partially sighted people living in Hackney. Each meeting will take place on the second Tuesday of each month at Navarino Mansions, Dalston Lane, E8 1LB from 13.30 – 15.30. Sometimes the time and venue may change so please ensure to get in contact with the details below. Meet everything 3rd Monday of each month from 18.00 – 20.00 at Crowlands Heath Golf Club, RM8 1JX. The group provides peer support, information and multiple social events. Previously we have had technology speakers, a pub quiz and a summer BBQ. ActivEyes are a user led organisation for blind and partially sighted people living in the London Borough of Redbridge and the surrounding area. We run a range of social and physical activities such as a monthly Breakfast Club on the first Friday of each month, quarterly members meetings, meals out, tennis sessions, and cinema visits. If you are visually impaired and living in Tower Hamlets why not come and join Beyond Barriers social and activity Group. We meet regularly twice a month, as well as having additional courses such as Money Matters run by Toynbee Hall and will also be running the course in Bengali. Some of the activities that we have had in the past include: Trip to the seaside, dinner and dancing, sailing experience, shopping and much more. VIPON is a new social and peer support group for blind and partially sighted people in Newham. Meetings are held on the third Wednesday of each month at the Star Lane Hub, from 14.00-16.00. Previous meetings have included: Drama activities, speakers on the Care Act and mystery shopping. Waltham Forest Vision is a user led peer support group for Visually Impaired people living and working in Waltham Forest. We have a range of different social activities such bi monthly meetings, monthly culture club, organised walks, dinner out and much more. A Newsletter in alternative formats is also available. Thank you for reading my entries, sadly it is goodbye from me, I wish everyone the best of luck. Hello you lovely people, it is time to check in with you again with my third blog entry. Six weeks still go by far too fast, I thought I’d have got used to it by now. Some will tell me it is called getting old, but I say time flies when you are having fun!! Sounds a whole lot better wouldn’t you say? This week I want to tell you about the importance of corporate partnerships, and our recent work with Lloyds Banking Group (LBG). 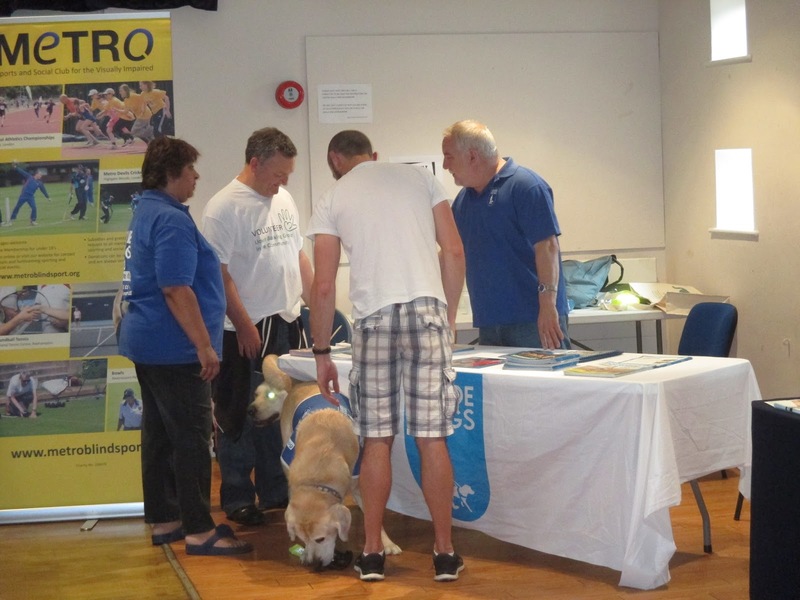 The time finally arrived, and the much anticipated Sight Information Day took place on Thursday 23 July at the Epicentre in Leytonstone. The day was a huge success and attended by over 50 members of the public, 10 exhibitors, Thomas Pocklington Trust staff and staff from Lloyds Banking Group (LBG) who volunteered for us on the day. Through the auction, selling of refreshments and exhibitor fees we raised £786.76, which will be match funded by Lloyds Banking Group up to £500 giving us a grand total of £1286.86. This will allow us to continue to support blind and partially sighted people across East London. Thank you to LBG for the opportunity of match funding us! I feel the day was a great success and judging by the feedback everyone who attended thought so too, with one member of the public saying: “I live in East London, but didn’t know about ELVis and the services it offers until today, so I’m glad I came along”. Hearing statements such as this is extremely frustrating, yet great all at the same time, because it clearly highlights the importance of events of this nature. There are 9,015 registered blind and partially sighted people in east London and reaching them is a challenge, but one I hope we can try and overcome by holding, or attending events to promote the work of ELVis. As part of the Sight Information Day we were fortunate to have the opportunity to partner up with LBG for their “Make a Difference” day. This proved to be an extremely beneficial partnership not only for ELVis, but I believe, equally a worthwhile and rewarding day for the Supplier Management team at LBG who gave up their time to volunteer for us. In advance of LBG volunteering for us, Hassan Khan and I spent some time with them in the afternoon on Wednesday 22 July to provide some vision impairment awareness covering terminology, sighted guiding and common eye conditions with the use of simulation spectacles. Tracey Walsh from LBG said: “The simulation with the glasses on Wednesday gave a sense of what real life is possibly like with this type of disability. My respect for active vision impaired individuals in the community went up considerably & this experience made me think about how lucky we are & what we take for granted”. I found it highly valuable meeting the LBG team in advance, as it strengthened and built on the rapport already created with Kelly Moizer-Peace via email, making for an effective working partnership on the day. As well as allowing Hassan and I to meet the rest of the team, it provided an opportunity for the LBG staff to feel comfortable, prepare for the volunteering day and ask any questions. It was fantastic to see their willingness to learn, their eagerness to take on a new challenge and throw themselves in. I believe that the corporate affiliation with LBG made for an excellent opportunity for us, as ELVis to demonstrate the abilities of blind and partially sighted people in an actual professional working environment. I believe partnerships such as these are important and invaluable as they help in breaking down barriers and allow vision impaired people to be seen in a positive light as independent individuals who can, and do wish to contribute to society. Kelly Moizer-Peace from LBG said: “My team were absolutely buzzing when we left on Thursday, the nerves we had on Wednesday are long gone. Thanks for being so warm and welcoming to us; it was our Day to Make a Difference but I believe its you that has made a difference to us.” A huge thank you to the team at LBG for their time, enthusiasm and willingness to assist from me and Team ELVis!! We look forward to working with you again in the future. Have an excellent few weeks, until next time!